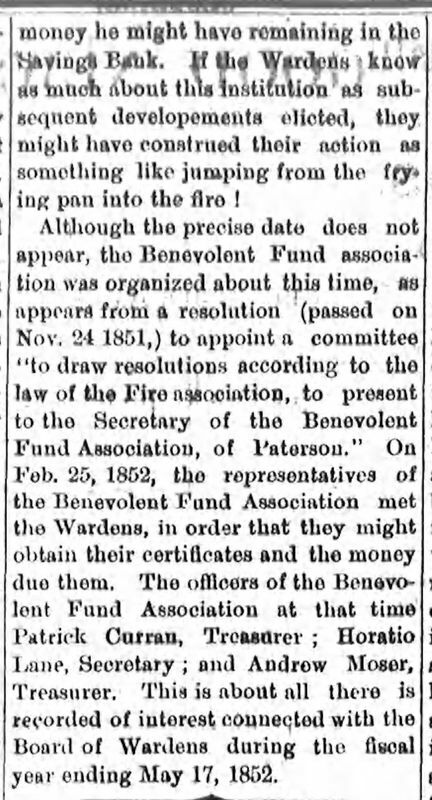 The only history that relates to the very early days of firefighting in Paterson comes from the assembled minutes of the Paterson Fire Association. In 1893 their records were edited and published by William Nelson. The book, of which only 100 copies were printed) covered the laws relating to the organization but also accounts of fires and other matters of interest from newspapers of the day. 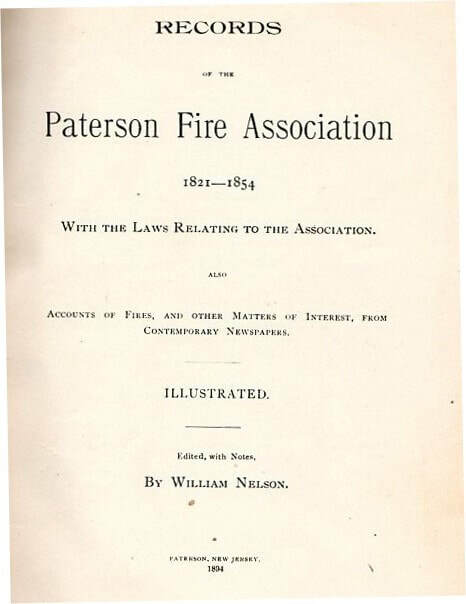 The Records of the Paterson Fire Association Manual detail with much particularity the rise and progress of the Paterson Fire Department covering a period of more than 30 years. The records in the book are as they were precisely entered in the original minute book with which the proofs have been carefully compared to ensure utmost accuracy. Any errors or omissions are to be found in the original records. 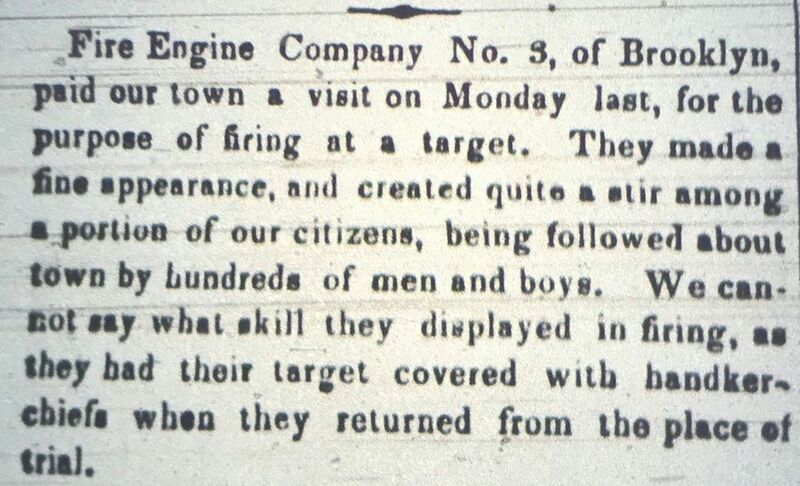 From the Bergen Express - July 5, 1819: Fire! On Sunday last the house belonging to Mr. John Amens of this town was burnt to the ground together with the furniture it contained. Editor William Nelson notes: "In neither of the above two excerpts is anything said of a fire company. 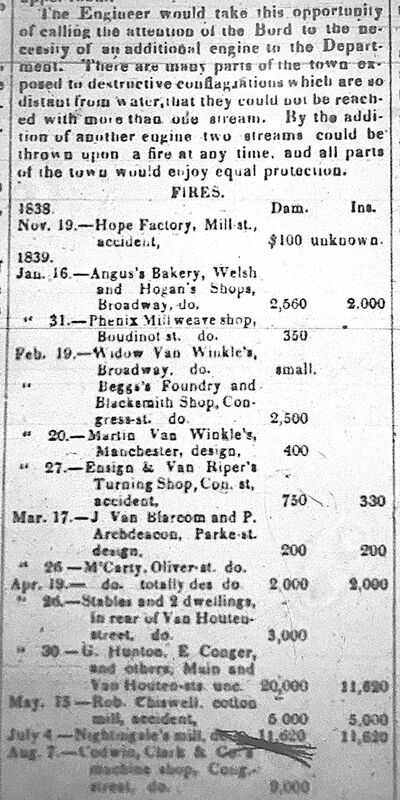 This negative testimony against the existence of such a company is of little weight, as the newspapers of those early days gave little thought or space to chronicling local events." 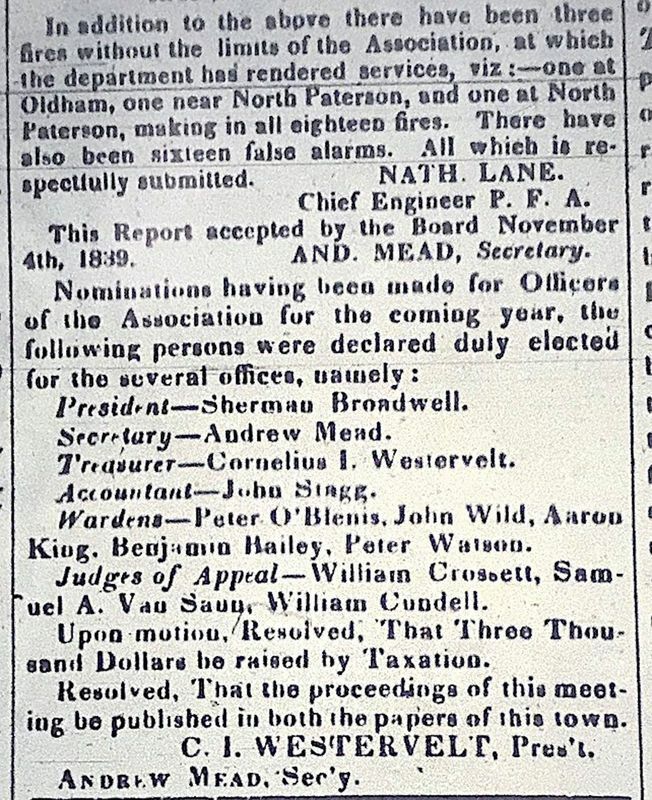 December 23, 1820: Inhabitants of Paterson had a meeting at the house of Benjamin Weller (~134 Main Street) for the purpose of taking into consideration the propriety of adopting measures to render the town more secure from the devastations of fire. Colonel Abram Godwin was chosen chairman. ​1) That it is expedient that the meeting adopt measures for the security of the town against fire. ​3) That Timothy B Crane, Adrian Van Houten, Samuel Colt, John Flood and Nicholas Smith be the committee for the purposes aforesaid. and sixty six dollars and there are a number of persons whom they have not yet called upon, and there is a probability that a considerable addition may yet be obtained. 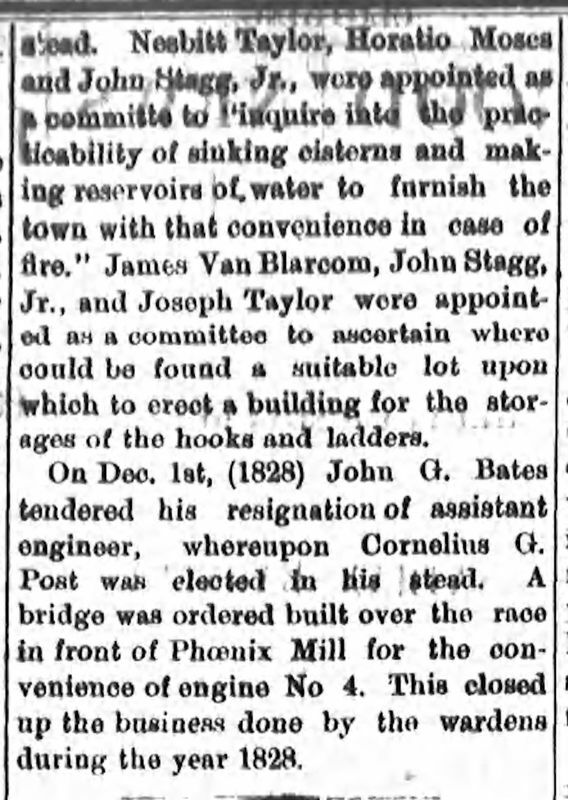 January 4, 1821: The secretary reported that he had not received any satisfactory answer from the inhabitants of Paterson Landing. He was instructed to call the inhabitants personally and request subscriptions. ​Daniel Holsman reported by letter that all of the information he has received in New York it was his decided opinion that Engine No. 3 could be procured for $550 or $600 including her complement of hose and is the one that subscribers ought to purchase. 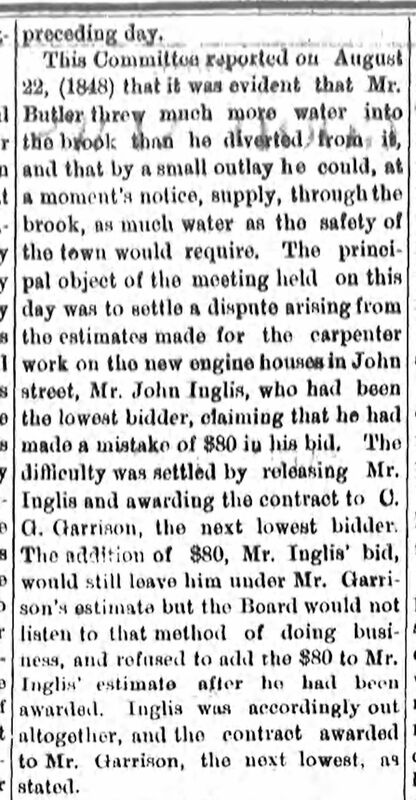 Mr. Crane who accompanied Mr. Holsman in New York also reported decidedly in favor of purchasing the Engine. 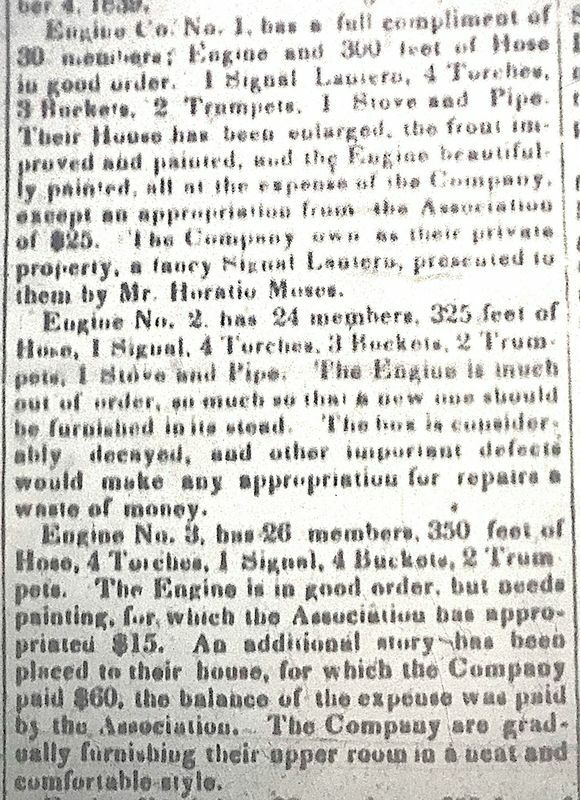 February 1, 1821: At a meeting of the subscribers to the Fire Engine Fund at Captain B. Wellers, Colonel Godwin Chairman and Andrew Parsons secretary, Holsman, Colt and Crane reported the purchase of a Fire Engine from Smith in New York which was unanimously accepted. The cost was $700 and the Engine has been brought to Paterson. 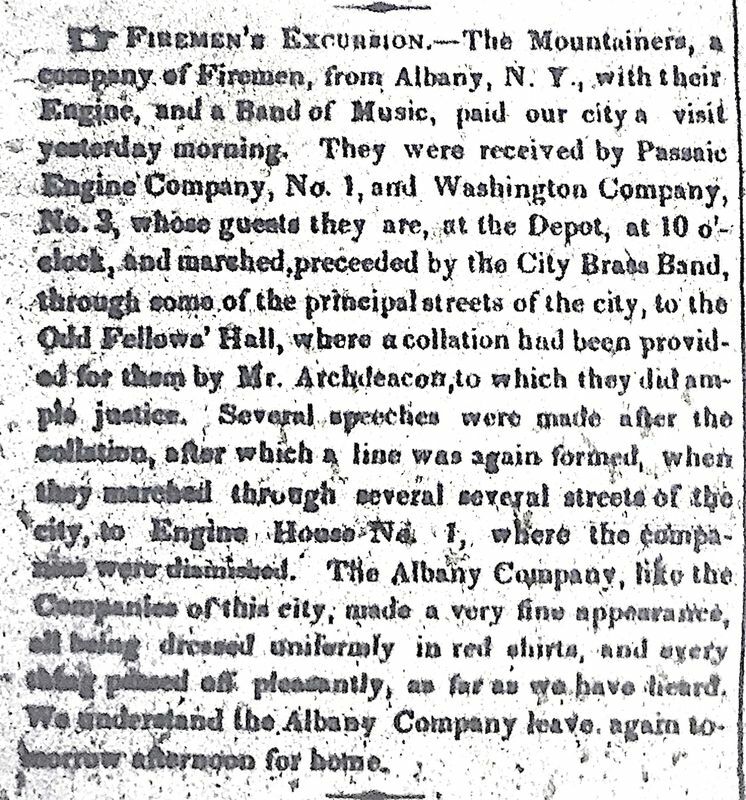 ​It was also resolved that A. Parsons, John Rutan, Caleb Munson Godwin, Wm Dickey Jr. and David Reid be a committee to collect subscriptions to the Fire Engine fund and the money collected be deposited in the Paterson Bank. 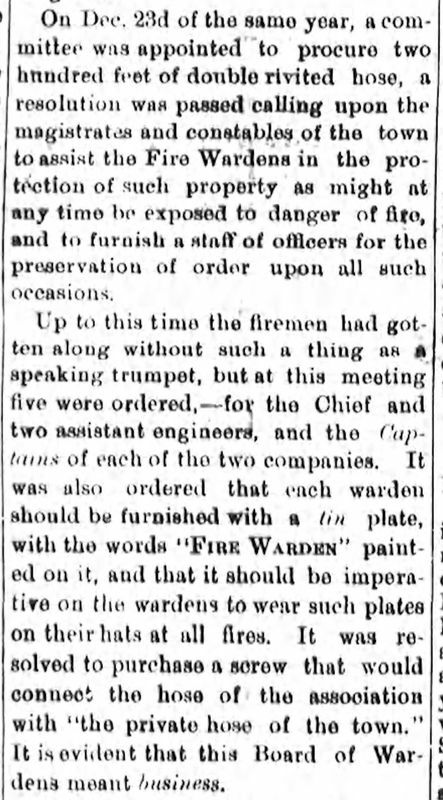 February 1, 1821: It was resolved that a board of Fire Wardens be appointed to continue in office for one year or until others are elected. Upon motion the following were appointed: T.B. Crane, Samuel Colt, Wm. 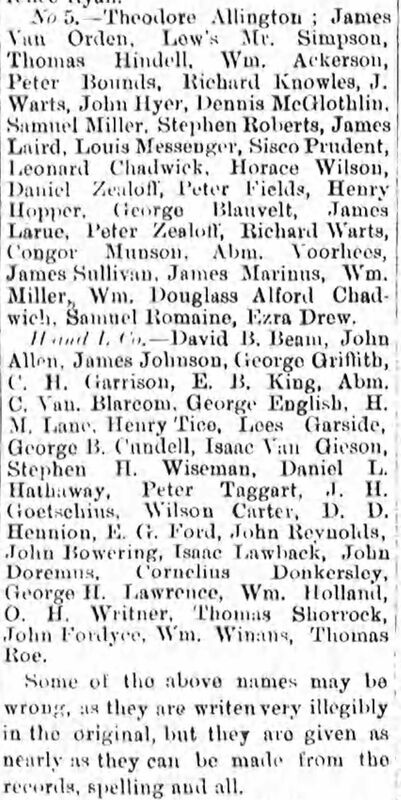 Jacobs, A Parsons, John Colt and Benjamin Weller and they shall appoint a president who shall be Chief Engineer and among their number a secretary and treasurer. Also resolved that the annual election for Fire Wardens be on the first Monday of December in every year. Daniel Holsman was unanimously chosen President of the Board for one year. Nominated as candidates for Chief Engineer were Wm. Jacobs and T.B. Crane and Samuel Colt. The motion was postponed for a full meeting of the board. 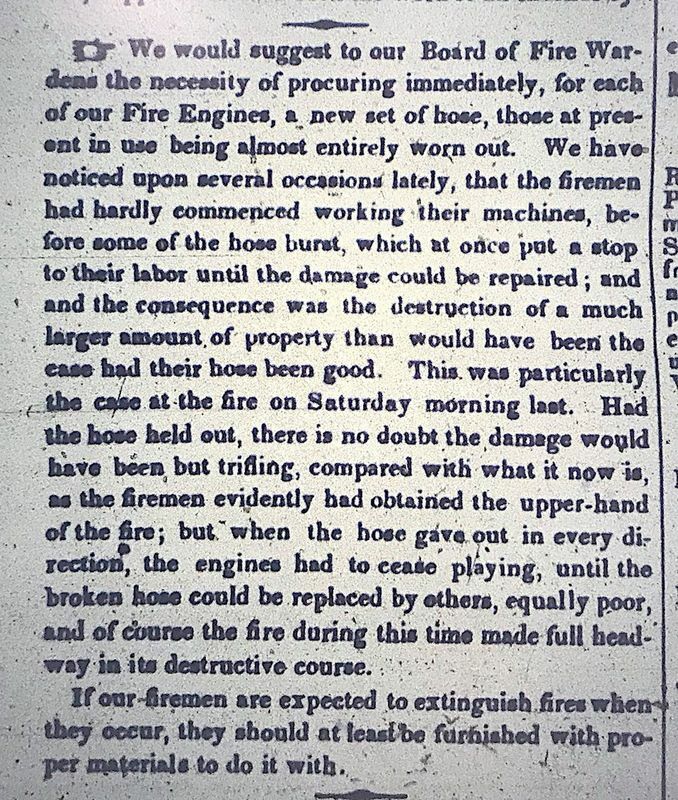 ​Daniel Holsman was appointed to obtain 100 feet of hose from New York of the best materials for the Engine. The following names were handed in by the different wardens who have signified their willingness to attach themselves to the Company. 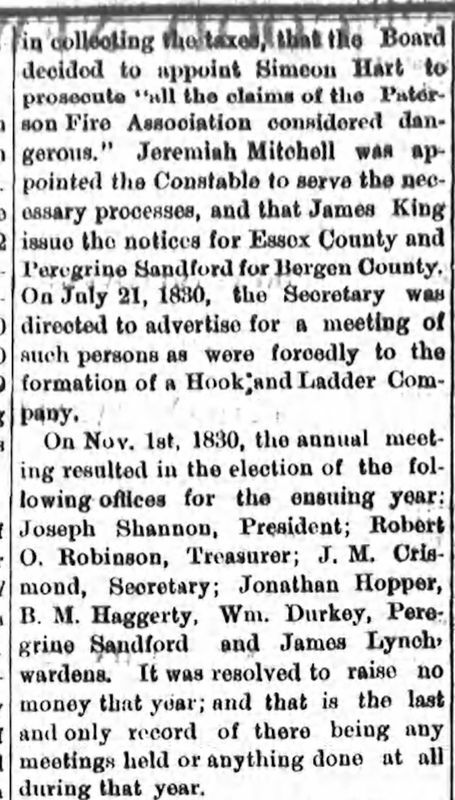 A meeting of the Board of Wardens at Captain B Wellers, Timothy B. Crane was elected Chief Engineer. 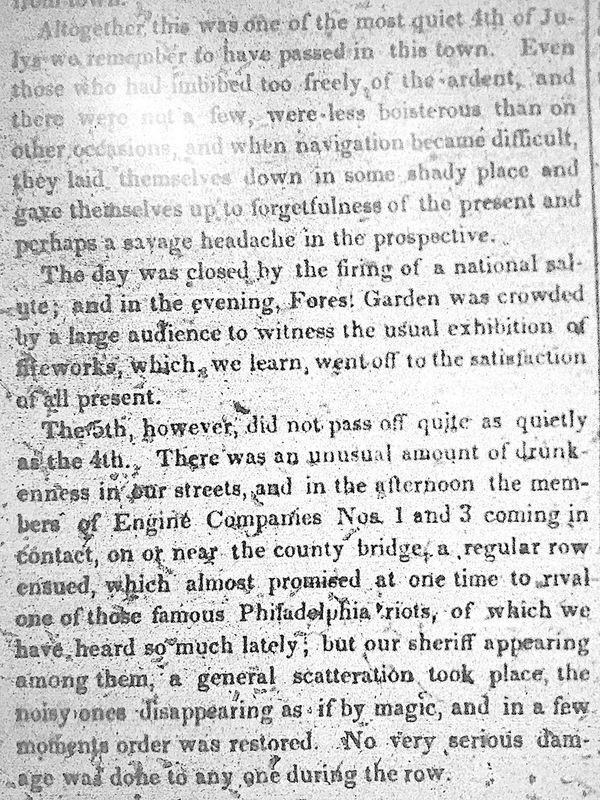 November 19, 1821: At a meeting of the Fire Wardens, at Captain B. Wellers, President Samuel Colt, John Colt, Benjamin Weller, W. Jacobs. Timothy B. Crane, and A. Parsons. Mr. Crane presented a copy of the act incorporating the Paterson Fire Association. It was resolved that a committee (Daniel Holsman, Samuel Colt, T.B. 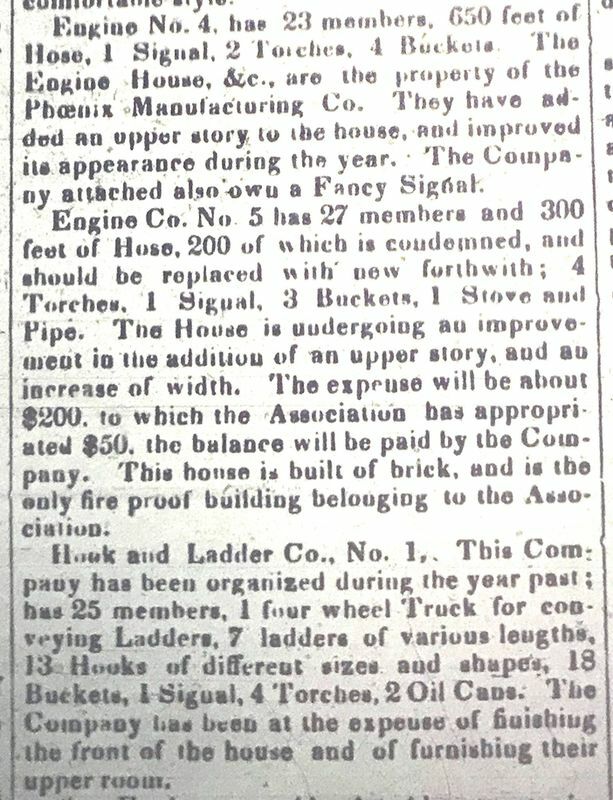 Crane) be appointed to ascertain the lowest price that Mr. Vasques' Fire Engine could be purchased for and report at next meeting. Them committee was also to ascertain the amount to be raised by tax on the Oweber of Houses and other properties for the ensuing year.